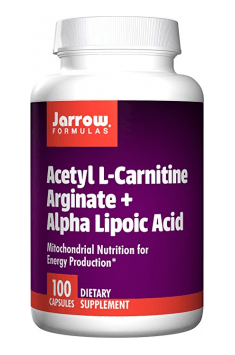 Jarrow Acetyl-L-Carnitine Arginate + Alpha Lipoic Acid is a dietary supplement with a carefully selected blend of synergistic ingredients which supports mitochondrial function and energy production – acetyl-l-carnitine arginate and alpha lipoic acid. The acetylated form of l-carnitine has the ability to cross the blood-brain barrier and thus much better bioavailability. Alpha lipoic acid (ALA) is a substance occurring naturally in the body which is characterised by high antioxidant activity. ALA neutralises effectively free radicals and has also the ability to bind heavy metals. What is more, ALA has a key role in regulating mitochondrial function. As a result, it promotes the body’s energy processes and may have a beneficial effect on age-related diseases in which a trigger factor is mitochondrial dysfunction. Acetyl-L-Carnitine (ALC, ALCAR) is an acetylated form of l-carnitine – a vitamin-like substance. L-carnitine plays a vital role in lipid metabolism and that is why it is believed to reduce body fat. L-carnitine takes part also in carbohydrate metabolism, provides acetyl groups for biosynthesis of acetylcholine and is involved in the transport of branched-chain amino acids (BCAAs). There are extremely interesting reports about a beneificial effect on L-carnitine on cardiovascular, kidney, liver and muscle diseases. Potential use of L-carnitine arouses interest of individuals doing competetive and recreational sport. L-carnitine was isolated for the first time in 1905 from muscles (hence its name from the Latin carnus or meat). L-carnitine is formed in the body from two amino acids – lysine and methionine. L-carnitine is found primarily in the skeletal muscles, heart, kidneys, liver and the brain. The main dietary source of carnitine is meat and dairy products. Requirements for L-carnitine increase, among other things, in the case of vegetarians, kidney and liver diseases and also after a great physical effort connected with e.g. hard work or vigorous workout. Alpha lipoic acid is a coenzyme for many mitochondrial enzymatic complexes which are involved in production of ATP (a energy molecule present in cells). ALA contributes to increasing glucose uptake in muscle cells. This promotes ATP production while speeding up energy replenishment. Owing to this mechanism, it is possible to do longer or more intense physical activity. L-carnitine is involved in lipid metabolism. By carrying oxidation products of long-chain fatty acids from perixosomes to mitochondria, L-carnitine helps burn them to CO2 and H2O in the Krebs cycle. This means that this substance is responsible for transporting long-chain fatty acids into mitochondria where they are subject to many metabolic processes, resulting in energy production necessary for normal function of body cells. What is more, l-carnitine takes part in removing medium- and short-chain fatty acids which may show a toxic effect on the body in acyl-CoA compounds. Some drugs like ampicillin can be removed from the body when they are administered with l-carnitine. Because of that, l-carnitine is vital to detoxification processes of body cells. L-carnitine is critical to the normal ratio of acetyl-CoA to CoA in cells. It increases availability of CoA for oxidative decarboxylation of pyruvate. Owing to that, it helps maintain the Krebs cycle. As a result, it can be useful in reducing lactic acid build up and increasing VO2max which can have a beneficial effect on the body’s physical performance. It has been demonstrated that l-carnitine takes part in metabolism of branched amino acids – valine, leucine and isoleucine, and has a significant role in carbohydrate metabolism. High l-carnitine levels in muscles may contribute to reducing glycogen utilization for energy production. Consequently, their benefits can be enjoyed by individuals doing a long workout. To sum up, Jarrow Acetyl-L-Carnitine Arginate + Alpha Lipoic Acid is a dietary supplement which increases the body’s energy storage and is thus recommended for strenuous physical and mental activity. The formula improves also lipid metabolism and may prove useful when reducing body fat. In addition, cardioprotective, neuroprotective and nootropic properties of this product account for its wide range of medicinal uses. Acetyl-L-Carnitine Arginate + Alpha Lipoic Acid 100 caps. L-carnitine in the acetylated form has a much broader spectrum of action than significantly lower doses of its traditional form. Because of that, just one capsule daily may work as a preventive measure. During strenuous mental and physical activity and for improving energy levels or vitality, it is recommended to take a slightly higher dosage – 2-3 capsules daily divided into equal doses. The formula should be taken preferably on an empty stomach 30-60 minutes before physical activity.